A Message for World Hospice and Palliative Care Day – Because I Matter! The theme for this year’s World Hospice and Palliative Care Day is “Palliative Care – Because I Matter!”. It aims to share our collective vision to increase the availability of hospice and palliative care throughout the world, by creating opportunities to speak out about the issues. To raise awareness and understanding of the needs – medical, social, practical, spiritual – of people living with a life limiting illness and their families. To help support and develop hospice and palliative care services around the world. In support of the organizing team at the Worldwide Hospice Palliative Care Alliance we lend our voice to echo the sentiments that palliative care needs to be integrated into workforce training and that continuing professional development opportunities be made available. To that end the de Souza Institute offers exceptional education opportunities for front line healthcare workers. Our Education in Palliative and End-of-Life Care-Oncology (EPEC-O) onsite One-Day Workshop takes place in Toronto on November 9, 2018. Additionally, the online course on Interprofessional Education in Palliative and End-of-Life Care (iEPECO) focuses on a person centred palliative care approach that addresses both physical and psychological challenges that patients and families encounter. 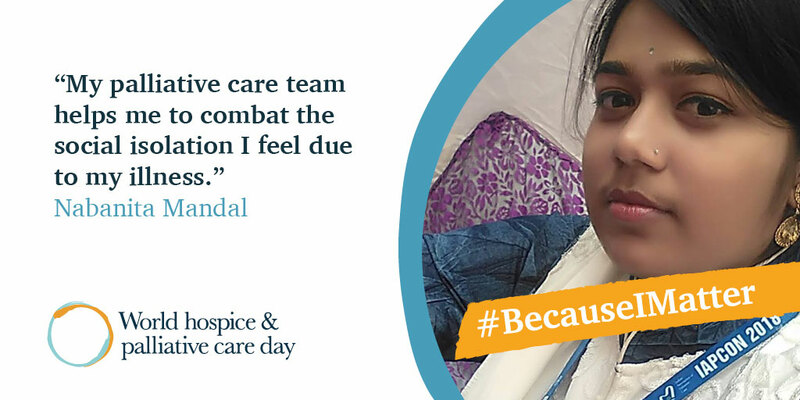 On this day we ask that you do your part to help raise awareness of palliative care. You can tweet or post on social media with the hash tags #‪becauseimatter or #WHPCDay18‬, you can have a conversation with a loved one or colleague, you can call on governments to listen to people who need or access palliative care or you can enroll in one of our palliative care courses. No gesture is too small or too big. It is up to all of us to ensure that dialogue continues and that we don’t leave those suffering behind.